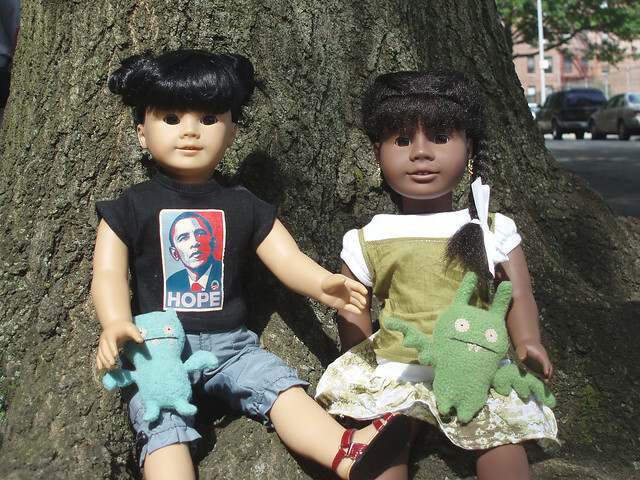 This afternoon, my friend Lia and I went outside to play with our Ugly Dolls on a giant tree. I love how big the roots are- they're perfect for climbing and pretending that Ice Bat and Poe are in caves. We pretended that Ice Bat and Poe were two babies who lost their mother and had to search for her in a jungle. One of the best parts of summer is the Mr. Softee truck! Lia and I could hear the truck coming when it was all the way down the street. I had a regular cone with chocolate sprinkles. It was Lia's first time in my neighborhood; in her neighborhood they have the Good Humor man. What's your favorite thing to get from an ice cream truck? I couldn't help responding, even if it is months late. We live in a borderline rural area, so e don't get the Ice Cream truck, but, when we go to New Hampshire we get the ice cream BOAT!